On Friday afternoon, I sprinted home from work at 2:30pm, hurried to finish my packing and cramming the car full of everything I could possibly need for 2 days away, said my goodbyes to Craig who was just leaving for a night shift and then sped up to the station to meet Kat who had very kindly offered to be my race crew and marshal for the weekend. After a last minute dash around the shops, picking up nothing that I actually really needed along with plenty of things I didn’t need, we were on the road North to Glenshee. The drive up was lovely and the weather was pretty much on our side, but as we got closer to our destination I suddenly got very nervous. Even though I have been planning and training for this race for months, I suddenly started to have major doubts in my ability. 55 miles – that’s a very, very long way. 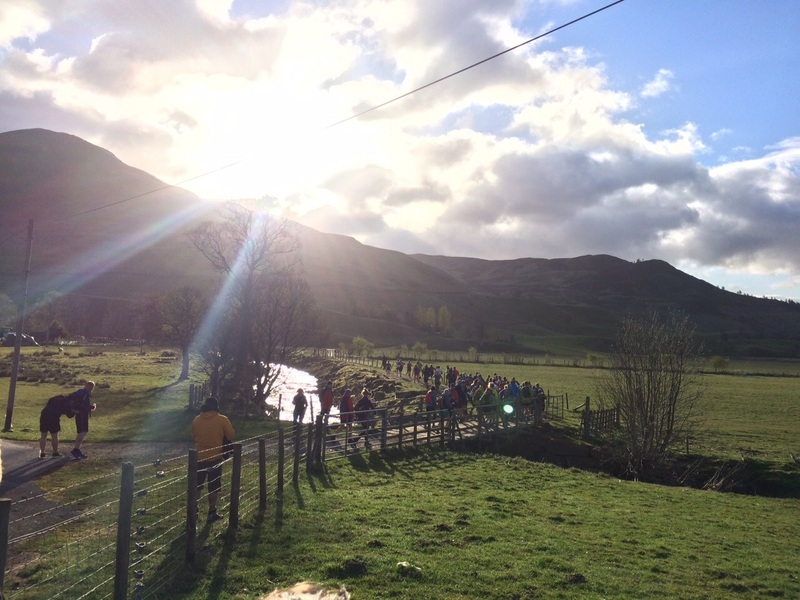 I arrived at Gulabin lodge, the new H.Q for the Cateran races, just after 7pm and registered with Julie. The goody bag is superb – a nice small holdall containing a beanie, chia charge bar and some other tasty goodies. 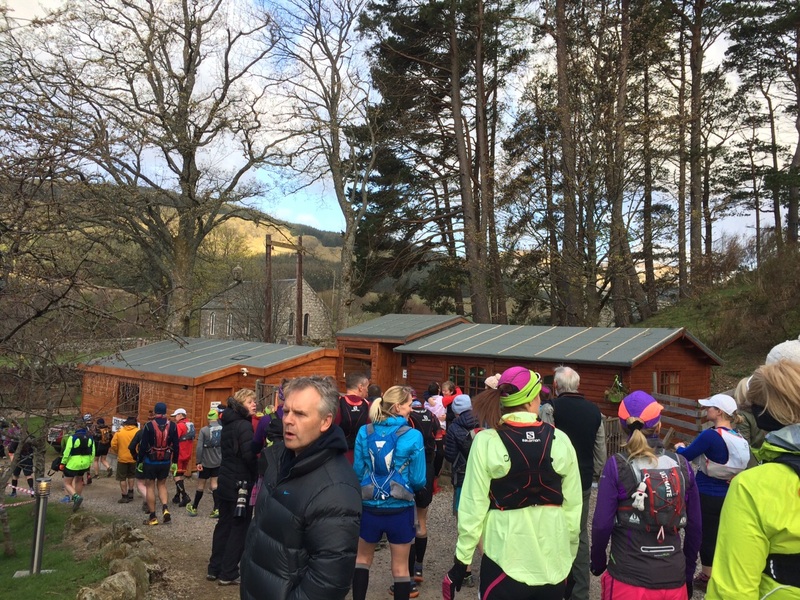 I went to round to find my allocated room in the lodge which I was sharing with Kirsty Burnett and Carol Martin – 2 ultra running superstars who were very lovely and gave me a good few pointers about the race and how to pace it. The remainder of the runners who were staying over night arrived in dribs and drabs over the nest few hours and over dinner I met load of new people who helped me calm down and think about the main goal of my race, which was just to enjoy a lovely long run in the hills with friends. I was worried I wouldn’t get a great sleep as I had been like a coiled spring, ready to explode all week and my energy levels were through the roof, but as soon as I had all my stuff laid out and had a good natter with the ladies, I was settled in bed and pretty much out like a light. I woke up a few times during the night and was slightly disturbed by the noise of the wind and rain on our sky light, but quickly drifted off again only to be woken by my alarm at 5am. I hopped out of bed, got my kit on and headed to the breakfast room for a good feed of porridge, coffee and a banana and had a quick chat with everyone before I headed back to my room to double check my drop bags and get my camelbak ready. 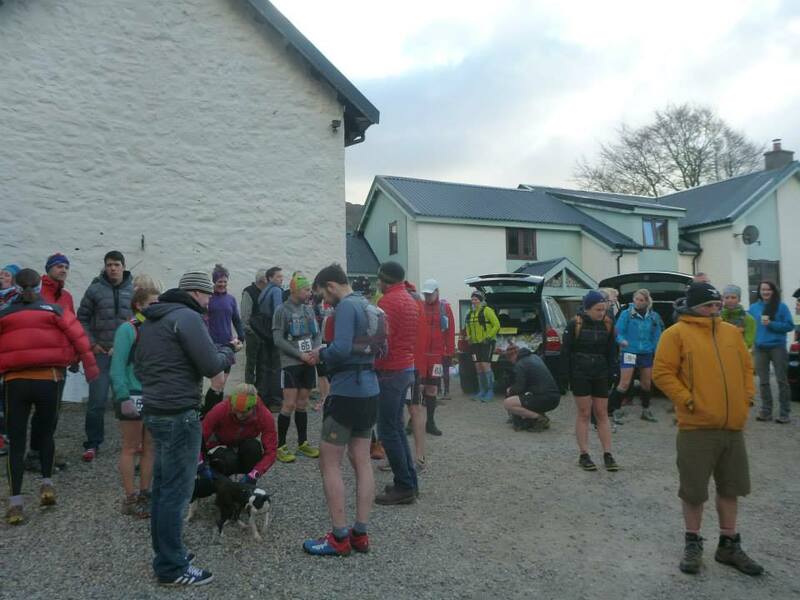 My stomach was now doing back flips and before I knew it we were gathered outside the lodge for Karen’s race briefing. 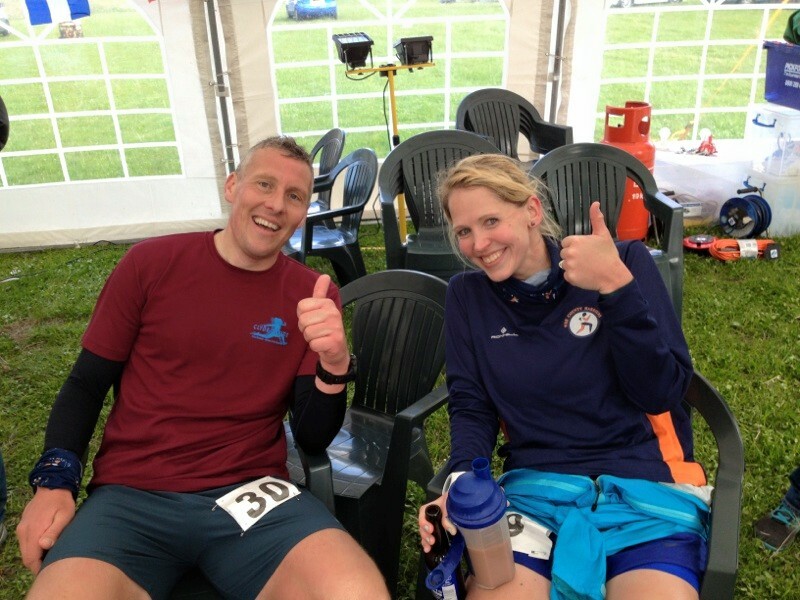 We were reminded that the 110 mile runners were still out on the course so to give them the support they deserved when we saw them and also to look out for each other – 55 miles is no walk in the park! Briefing over, 76 of us all walked over to the start of the trail and after a final few well wishes and hugs from my friends Karen shouted “go!” and at bang on 7am, we were off! Claire and I, ready for the off! 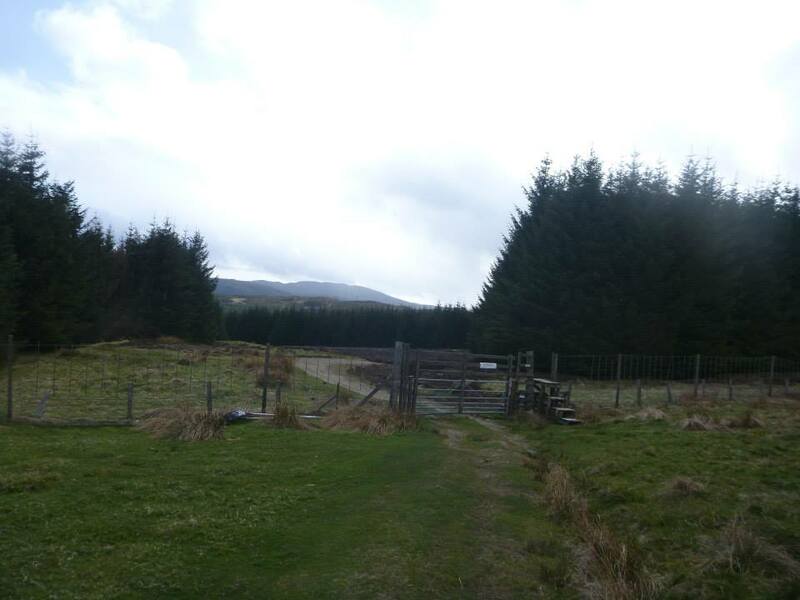 Enochdu – approximately 49 miles. I had drop bags at all the check points except the first one and decided to break the race down into bite sized chunks, concentrating on counting the miles between check points rather than my overall mileage. The first few miles slipped by easily. 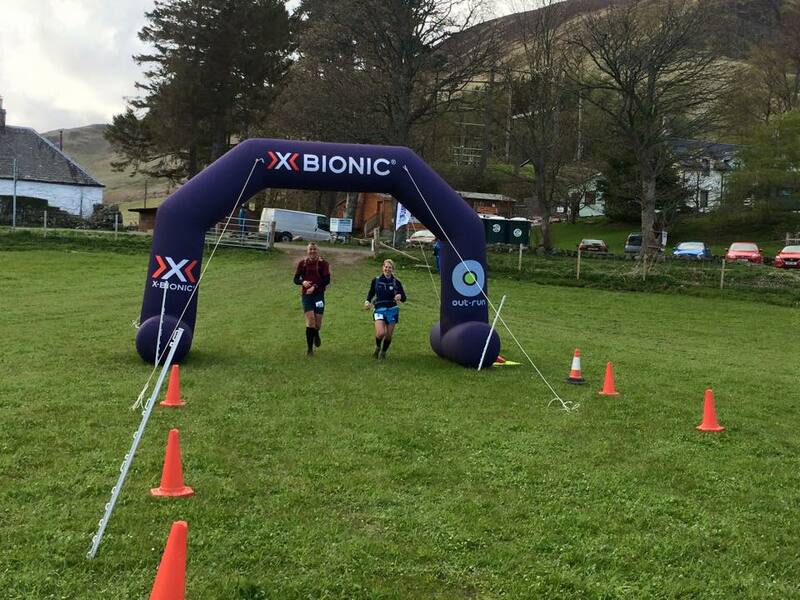 I started the race with Claire but after the first few miles and a nice grassy downhill, I pushed ahead and ran on my own for a while. I’d started off wearing my long sleeved top, but within 10 minutes it was off and my sunglasses were on. Glad I had brought all options available with me! I had made a conscious decision to take the first section really easy and see how I felt when I got to the check point. Having never run this far before I knew I could start off feeling fantastic but quickly decline if I went out too fast. After many a muddy field, stile and ditch I reached the first check point in 1.01.20. The next few miles were on tarmac and as I plodded on at a comfortable pace, quite a few runners whizzed by me. Usually this would activate my competitive mode but no, not today. I cheered them all on and carried on at my steady pace reminding myself to eat little and often. After a few miles on road we took a sharp left and after climbing the highest stile I have ever seen, we were on an uphill slog for a while. 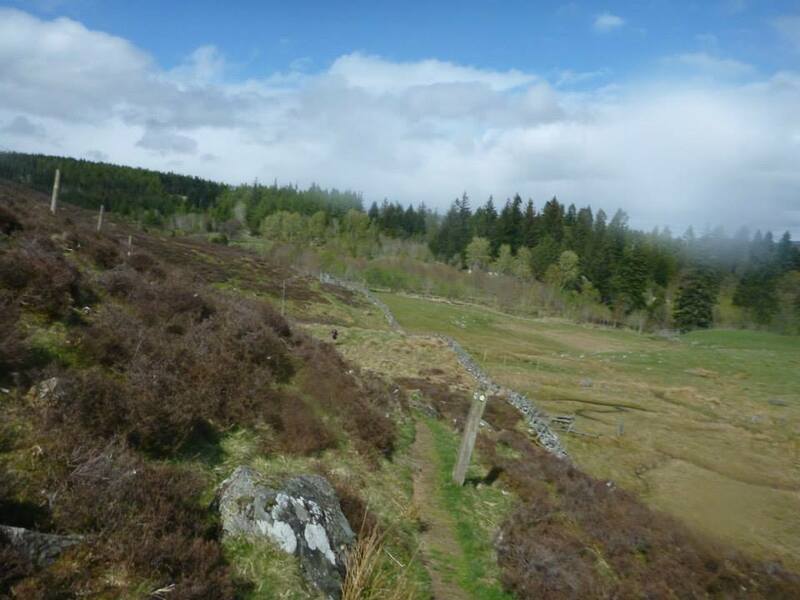 Before long we were running above a gorgeous loch and then it was time to free wheel downhill through a forest and enjoy letting our legs relax on the soft springy bed of pine needles. Going through the next few fields I found myself surrounded by cows and their young which made me a bit wary, but I think the calves were just having fun running around with us. I arrived at the second check point in 2 hours and 35 minutes. Arriving at the check point I was greeted by Julie, Sandra and Helen who were dressed head to toe in neon and having a bit of an 80’s party! I refilled my pockets and quickly munched a babybell and a few pieces of flap jack before heading on my way and running the next few miles with Kirsty and Victoria Hunter, who were running the whole race together. We lost the trail just after the check point and ended up having to climb over a barb wire fence (my bad – sorry ladies!) but a few miles out after the check point I dropped back slightly and told them to push on as my lower back had started to ache. Climbing over another stile, I tripped slightly and landed heavily which made a pain shoot right up my leg and into my back and at that point the tears were close. I slowed my pace right down and took a couple of paracetamol and when I started to run again the pain was worse. 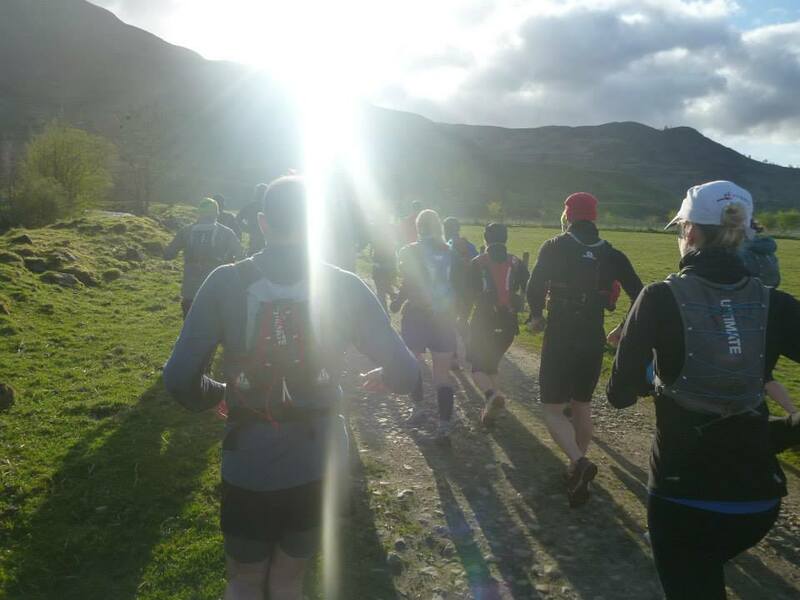 For brief moment I thought my race could be over, but then as I crested the next hill mumbling to myself I caught up with 3 of the 110 mile runners who were still laughing and joking. That gave me the shake a I needed – I wasn’t even 20 miles in and was moaning already and here were these guys who had been out all night and were still going. 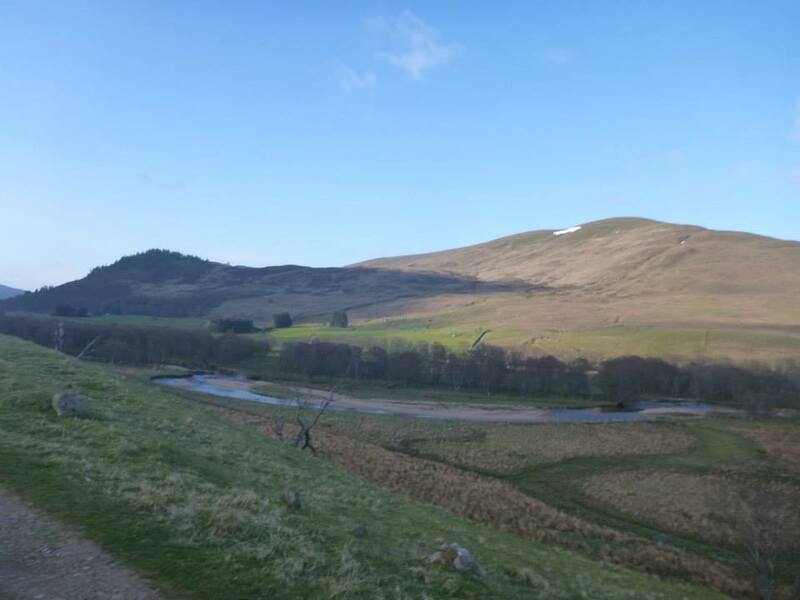 I had a quick chat with them and then the pain killers must have kicked in as I pushed on and ran the next 5 miles all the way to Den of Alyth where I knew my friends were waiting on me. 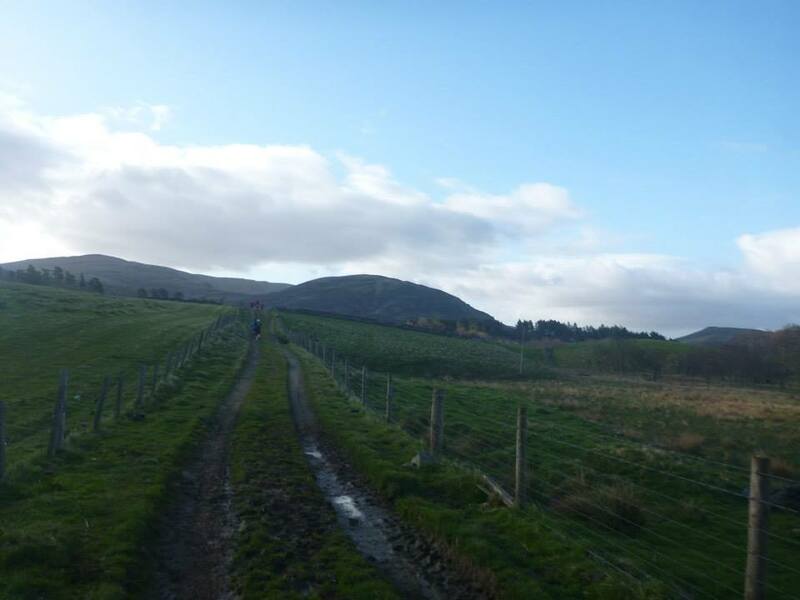 Elapsed time to Alyth – 4 hours and 41 minutes (25 miles). I flew down the hill into Alyth and stopped for quick hug from Kat who was marshalling here. 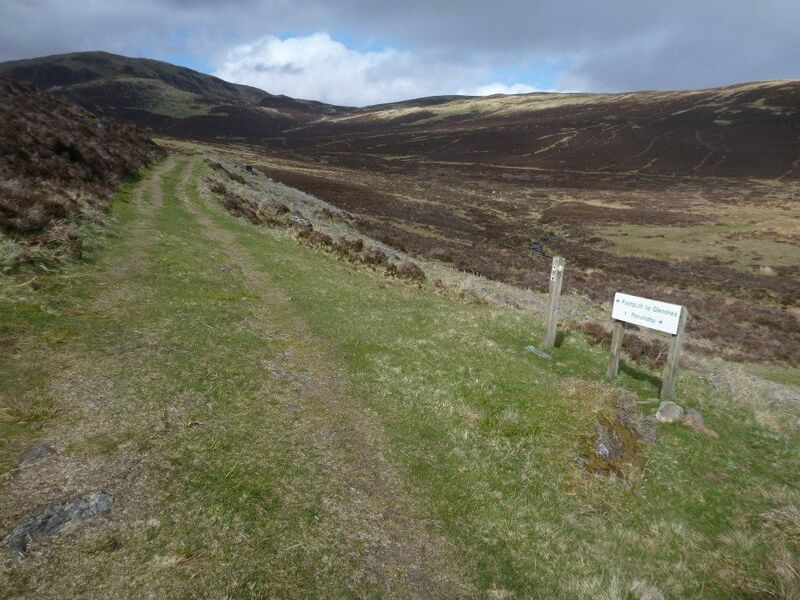 I stormed down the hill into the Den of Alyth feeling strong and quite hungry! Rhona and Graeme were here and it was good to be told I was looking so strong when not an hour previously I had been ready to pack it in. I refilled my water and inhaled and banana and some more flapjacks before heading onwards – only for someone to yell at me that I was going the wrong way! I couldn’t quite see who it was, but thank you!! 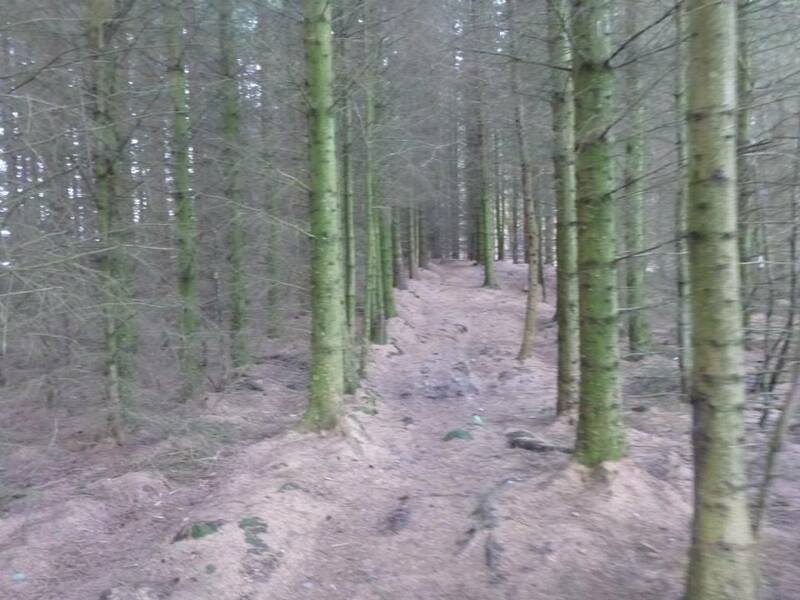 After what felt like a very, very long slog up hill, we arrived at Drimmie Woods where I enjoyed another good run over the springy forest floors and some exciting leaps over the biggest, boggiest mud trenches caused by tree felling equipment. I found the make shift bridge the marshals had set but from looking at the race photos I can see there were plenty who didn’t find it!! 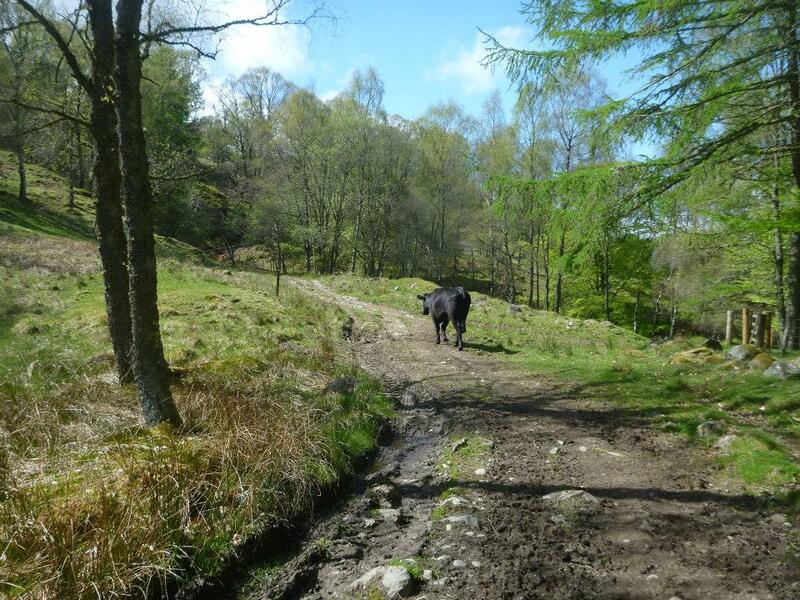 The forest path spat us back out on to a road which lead us down to the Blairgowrie check point. Elapsed time 5 hours 51 minutes (31 miles). The Minions of check point 4! I had another quick check point stop and on leaving I noticed Derek heading the wrong way out of the check point. I yelled after him to get him back on course and we ended up running the rest of the race together. It was good to have company as I knew I’d hit some low points in this section. 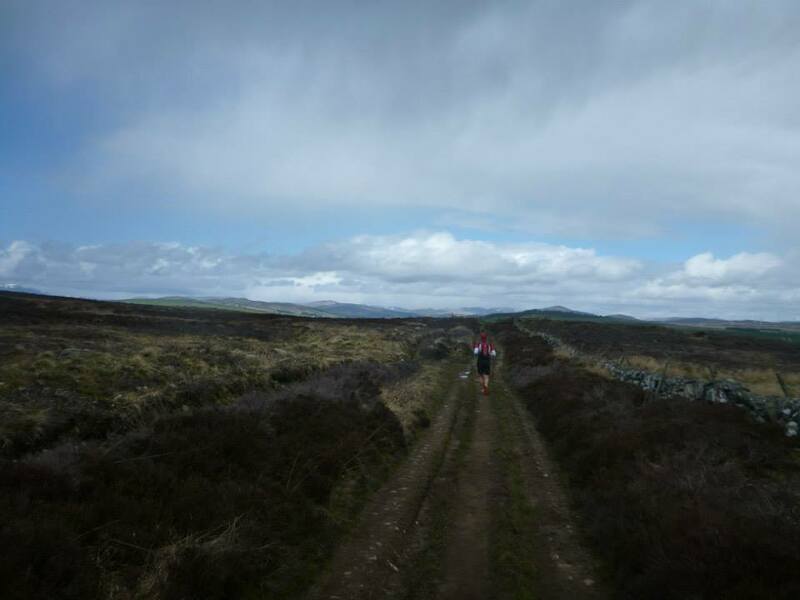 We carried on walking the hills and running the flats and downhill sections and managed to catch up with another runner – the first we had seen in hours! I was feeling O.K at this stage. My back pain had eased off but I was beginning to feel a blister brewing on the sole of one of my feet. Nothing too bad at this stage, so I pushed on to the next check point. 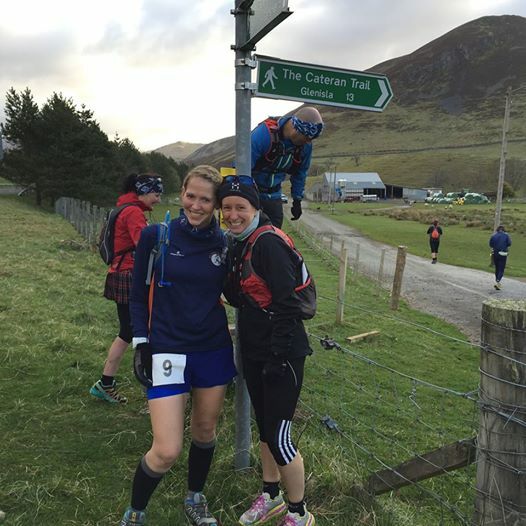 We came into the Bridge of Cally check point which was manned by Ian Beattie and his team and after finding out I was sitting 40th overall at this stage I was desperate to get a move on and see if we could catch anyone else. Pockets filled and sunglasses back on, we pushed on out of the check point in an elapsed time of 7 hours and 22 minutes. 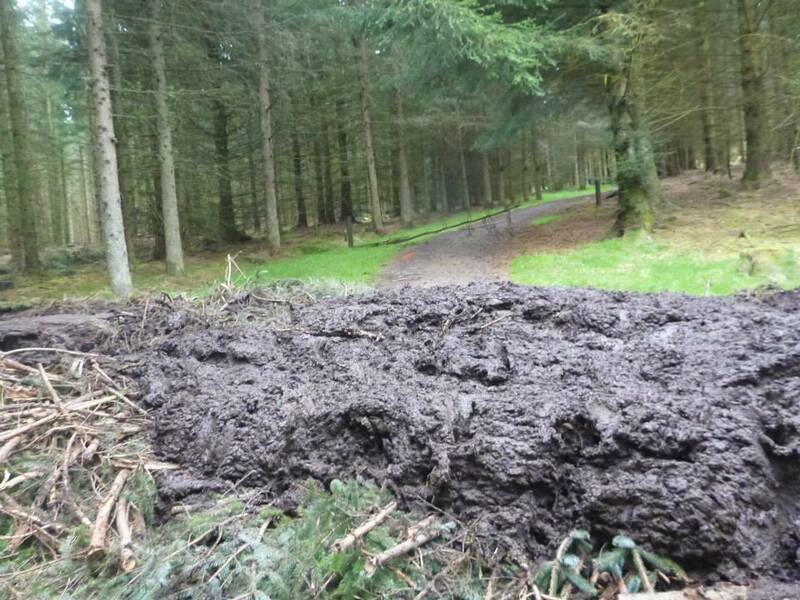 We had run this section a few weeks ago, so knew what to expect which I think really helped this far into the race. All hills were walked and all down hills were ran/shuffled. I tried to keep my spirits up as I was starting to tire but things were starting to hurt. 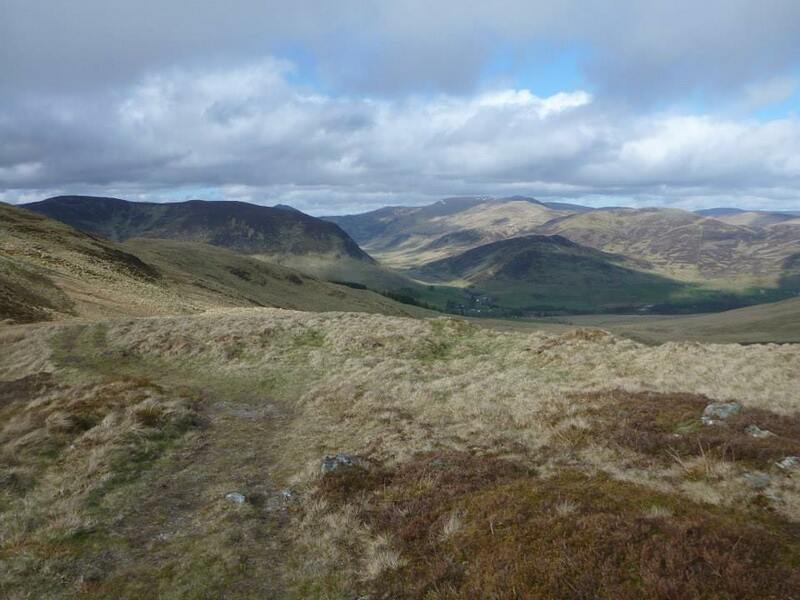 I think is my favourite part of the route – beautiful trails and views, and so much wildlife! 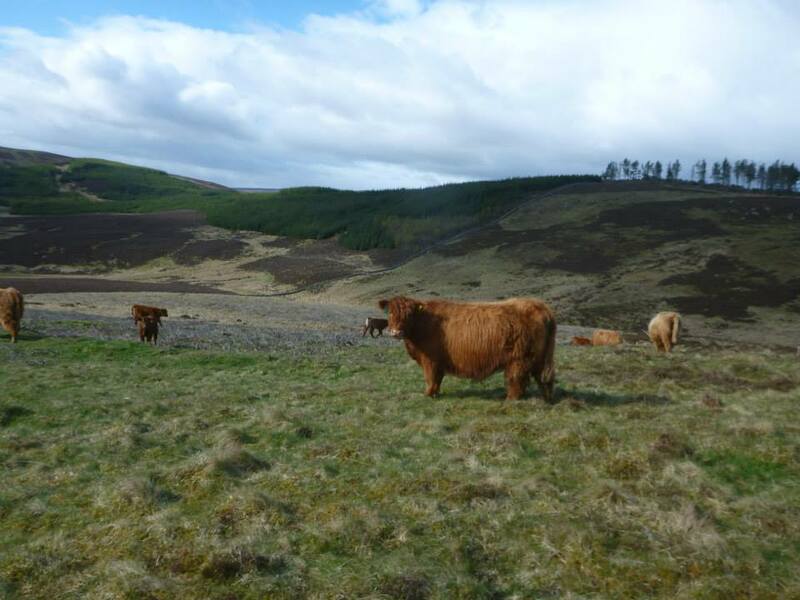 I saw 3 or 4 red squirrels, birds of prey, hares, deer, new born lambs, calves…. all the cute things to keep my mind off the pain! There’s a pretty tricky/boggy section a few miles before you get to Kirkmichael where my shuffling became more of a stumble and I manage to rip my knees open in some thorns. At least the stinging took the pain away from my feet for a while!! 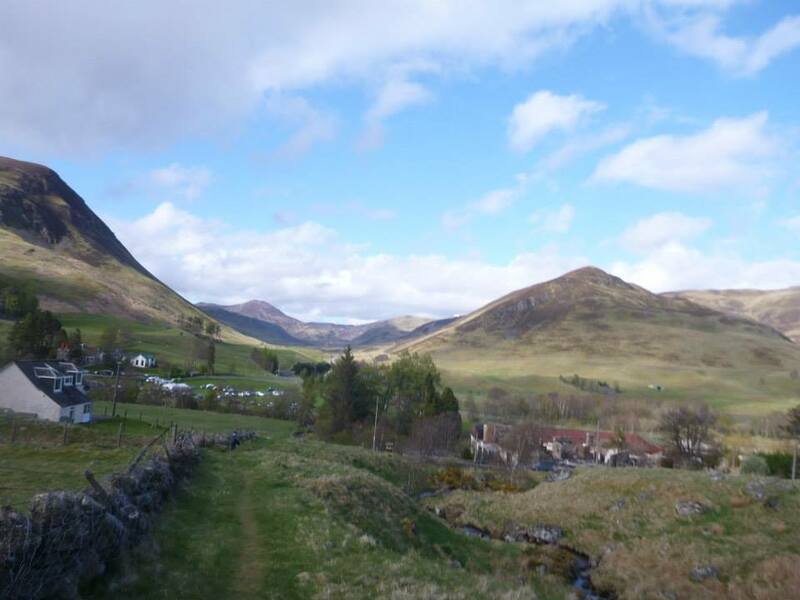 Before long we were heading out of Kirkmichael towards Enochdu when the heavens opened and I was soaked within seconds. Luckily it lasted a matter of minutes before the sun broke through again. 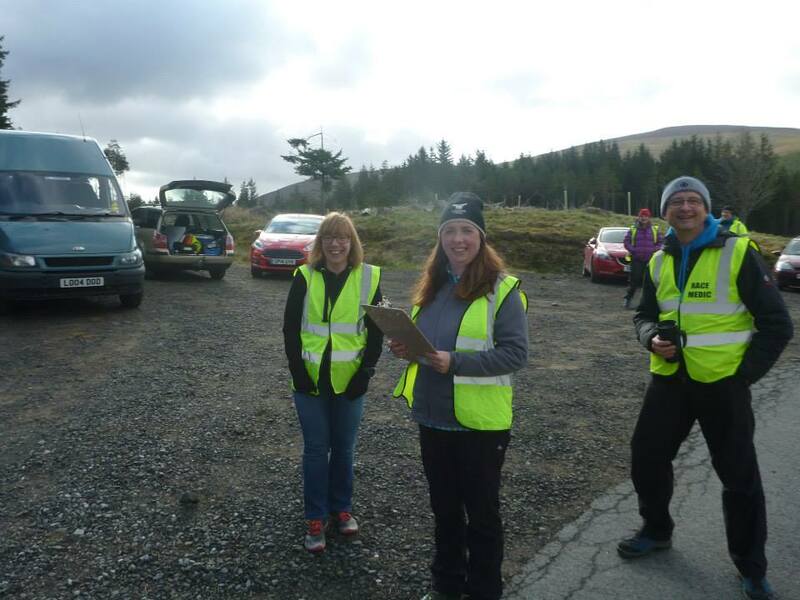 We trundled into Enochdu and I couldn’t have been happier to see the marshals at the last check point!!! 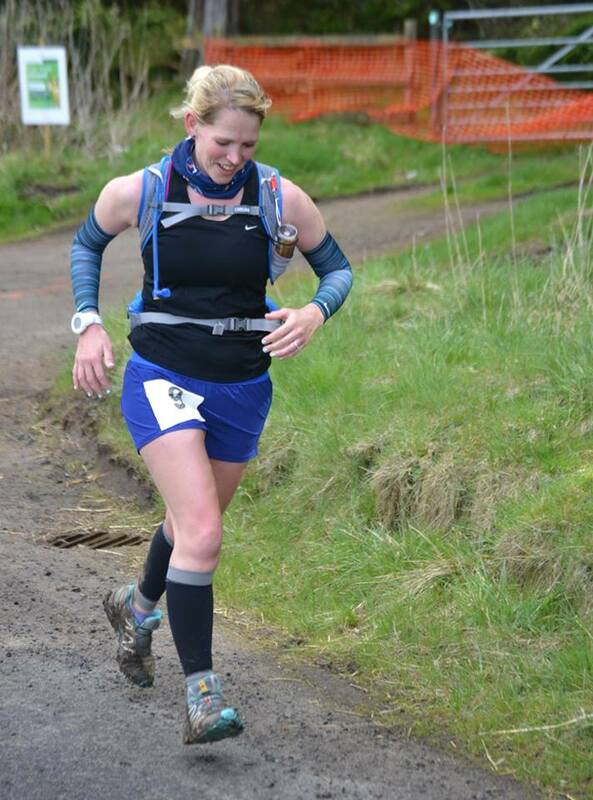 I took the last of my flap jack and a kitkat and passed my gin in a tin on to Julie as I didn’t fancy it and again within minutes we were on our way for the last 6 mile section. Elapsed time – 9 hours and 52 minutes. 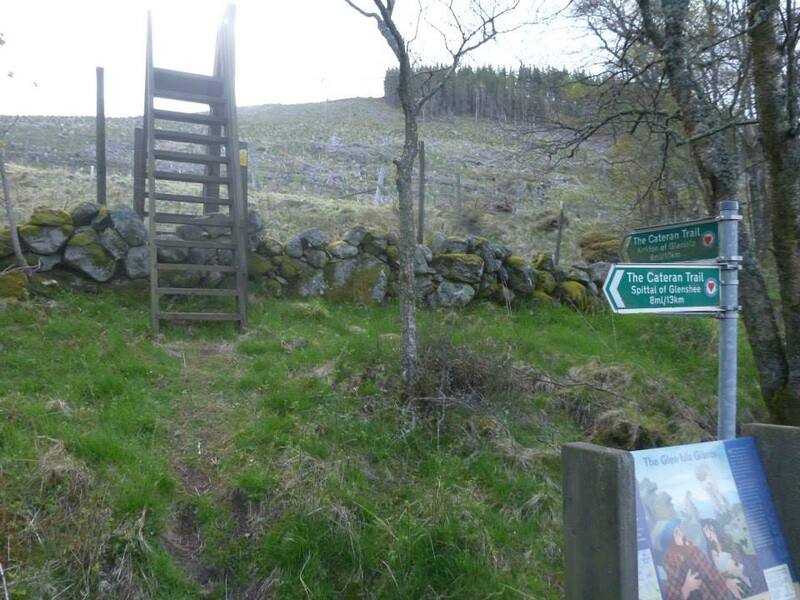 The last section begins with a climb…. and then carries on going up, and up… and up! Finally I could see the final hills in the distance. All I had to do now was get up and over there, but every single step was sending shooting pains up my legs. I was so desperate to pick up the pace, but I couldn’t quite lift my legs high enough to class it as a run! We reached the last steam (the one I fell in last time I was here) and I had a momentary dilemma – do I leap over it from my bad foot, or onto my bad foot?! I gave up caring and just went for it… and miraculously cleared it this time! Finally it was up, up, up… and we were at the top. I paused briefly to catch my breath and glance down at what lay ahead – the white dots at the bottom of the hill was our final destination and nothing was going to stop me from getting there. I tried once again to pick up the pace but the descent was taking it’s toll on my knees to I slowed down and just took it one step at at time. Finally the terrain was more runnable, so I gave it everything had left and bounded down to the last marshal at the gate. We were told we had 2 minutes to make it in 11 and a half hours, and that was all we needed to get the legs working over and run with everything we had left round to the finish line. As we came over the bridge and turned into the camp site, I could see and hear my friends cheering us in. Kat, Rhona and Graeme, along with Karen and George were standing there waiting to dish out the hugs and I couldn’t get there fast enough! I was ushered into the tent to sit down and the reality of what I had just achieved finally hit home. I had just been on the go for 11 and a half hours and covered 55 miles and over 4000ft of elevation. That’s not somethng you do every day!! After a shower and a good feed up at the lodge, we all gathered in the marquee for the prize giving. 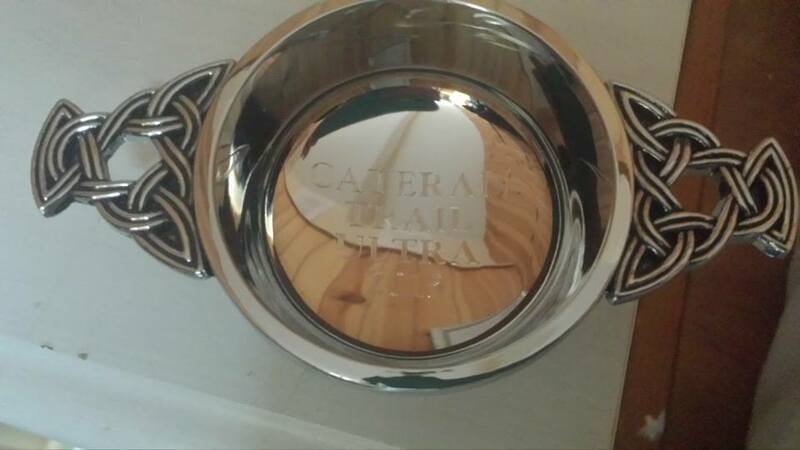 I received my quaich and was positively bursting with pride when Karen read out my name. The rest of the night was spent catching up with friends over a few drinks before I decided I was utterly exhausted (and a little sun burnt!) and decided to call it a day. This race was just amazing. 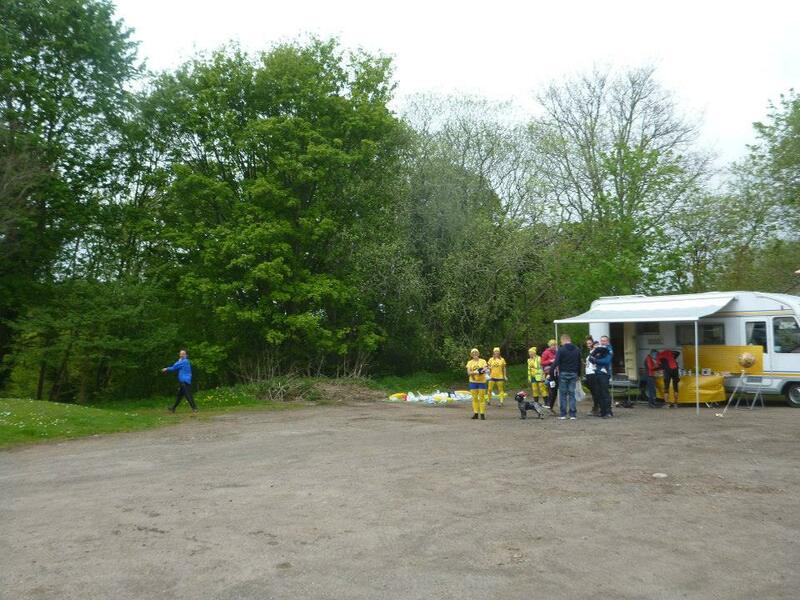 The organisation, location, friendliness, wonderful support and of course the weather!! I couldn’t have asked for anything better. I will definitely be back!